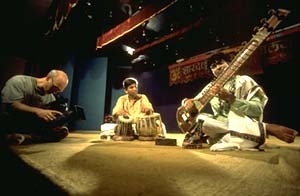 Filming an interview with Dr. S. B. Roy in West Bengal, India. We believe that the most effective way to inspire involvement with an institution is to give the audience a feeling of identification with the people who make up the institution. A rich tapestry of personalities, concepts, and events conveys the sense that tremendous opportunity awaits. Our programs have a "documentary" feel, are conversational in tone, sometimes anecdotal, and humorous when appropriate, and always human. Together with our clients, we develop a workable budget and a plan for getting the most use out of the diverse materials to be gathered for a project. The rather organic production process then begins with a careful examination of whose voices should be heard - which individuals have the stories and perspectives that make up the essence of an institution's story. We choose interviewees very carefully, concentrating on people who speak effectively and in a way that establishes a genuine engagement between the speakers and the audience. This inquiry frequently leads beyond the predictable choices of executives and board members; often, an institution is engagingly personified by individuals well below the leadership ranks. Anne Rutledge interviews each person in a recording session that is really a long-form casual conversation - no scripts, no list of questions provided in advance, and often approaching an hour or more in duration. This personal, wide-ranging approach subtly and skillfully gathers extensive information, and leaves each interviewee with a sense of affirmation about the experience. Each interview is then completely transcribed, generating hundreds of pages of from-the-heart stories about the institution. From these transcripts, Anne then begins to distill and distill and distill, selecting those words and stories that as a whole effectively and dramatically clarify the message. The script that is thus generated captures the very essence of the institution. From the script we then plan the visual half of the story, working with our gifted photographers to acquire evocative images that will complement our rich script. Depending on the project, we work in digital video, analog video, 16mm film, and frequently 35mm photographs. We love the striking visual compositions made possible by the emerging widescreen (16:9) video format. 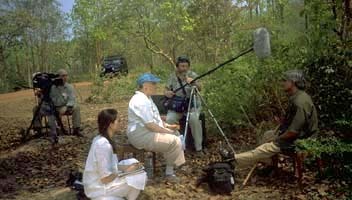 As with our long-form interviews, we plan for and shoot a wide range of scenes and occasions, often covering several hours of tape. To our minds, shooting a documentary-like film should be a process of discovery. We frequently come upon unexpected "delights" that add depth, interest, and dimension to the production. We like to be flexible in our thinking as we gather audio and visual material for a production, in order to take advantage of the gems that surface along the way. Editing the video is another process of distillation, selecting the best of the best to further bring out the essence of the institution we're depicting. We use original music, either from the subject institution itself or from our composer collaborators -- never canned "needledrop" recordings. Ambient sound, and, when appropriate, archival materials, also add to the vibrancy and immediacy of each piece. We edit everything digitally and in-house, with broadcast-quality output. If our job is to build a web site or produce an audio CD (rather than a video), parts of the technical process are of course slightly different. The interviews are always there - for the web they'll end up being streamed; for a CD, we'll leave the video cameras at home. Our work is more about the substance of the product than the form. No matter what the medium, our job is to skillfully and artfully choreograph the story that is told by an institution's own people, in their own words and with their own specific nuances, and their own sounds and images. The full interview transcripts can be re-used as source text for printed materials: one client created a series of informational brochures based on quotes taken from our extended interview transcripts. The interview recordings themselves can be re-used in other productions, or as source material for broadcast or streaming applications: a school client, for example, took interviews done for a fundraising video and used separate audio edits of interviews with key personnel as streaming content to augment the admissions and alumni relations sections of their web site. The huge amount of video we shoot can be re-used in additional productions: another client asked us to use video and film we had shot for a fundraising piece to create four 30-second television commercials. Any still photographs we take can be re-used in printed materials, on the web, in videos, and for press purposes.